GDP shrank at an annual rate of 6.1% according to the First Quarter 2009 Advance GDP Report. 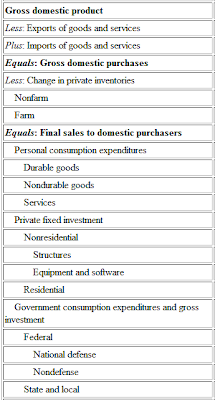 Real gross domestic product -- the output of goods and services produced by labor and property located in the United States -- decreased at an annual rate of 6.1 percent in the first quarter of 2009, (that is, from the fourth quarter to the first quarter), according to advance estimates released by the Bureau of Economic Analysis. In the fourth quarter, real GDP decreased 6.3 percent. Real personal consumption expenditures increased 2.2 percent in the first quarter, in contrast to a decrease of 4.3 percent in the fourth. Durable goods increased 9.4 percent, in contrast to a decrease of 22.1 percent. Nondurable goods increased 1.3 percent, in contrast to a decrease of 9.4 percent. Services increased 1.5 percent, the same increase as in the fourth. Real nonresidential fixed investment decreased 37.9 percent in the first quarter, compared with a decrease of 21.7 percent in the fourth. Nonresidential structures decreased 44.2 percent, compared with a decrease of 9.4 percent. Equipment and software decreased 33.8 percent, compared with a decrease of 28.1 percent. Real residential fixed investment decreased 38.0 percent, compared with a decrease of 22.8 percent. The real change in private inventories subtracted 2.79 percentage points from the first-quarter change in real GDP after subtracting 0.11 percentage point from the fourth-quarter change. Private businesses decreased inventories $103.7 billion in the first quarter, following decreases of $25.8 billion in the fourth quarter and $29.6 billion in the third. Real final sales of domestic product -- GDP less change in private inventories -- decreased 3.4 percent in the first quarter, compared with a decrease of 6.2 percent in the fourth. Real gross domestic purchases -- purchases by U.S. residents of goods and services wherever produced -- decreased 7.8 percent in the first quarter, compared with a decrease of 5.9 percent in the fourth. Current-dollar personal income decreased $59.9 billion (2.0 percent) in the first quarter, compared with a decrease of $42.9 billion (1.4 percent) in the fourth. Personal current taxes decreased $193.5 billion in the first quarter, in contrast to an increase of $19.7 billion in the fourth. Disposable personal income increased $133.6 billion (5.1 percent) in the first quarter, in contrast to a decrease of $62.6 billion (2.3 percent) in the fourth. Real disposable personal income increased 6.2 percent, compared with an increase of 2.7 percent. Personal outlays increased $18.1 billion (0.7 percent) in the first quarter, in contrast to a decrease of $260.2 billion (9.5 percent) in the fourth. Personal saving -- disposable personal income less personal outlays -- was $453.0 billion in the first quarter, compared with $337.4 billion in the fourth. The personal saving rate -- saving as a percentage of disposable personal income -- was 4.2 percent in the first quarter, compared with 3.2 percent in the fourth. The biggest negative factor in GDP was the change in private inventories which subtracted 2.79 percentage points GDP compared with a subtraction of 0.11 percentage points last quarter. Meanwhile personal consumption added 1.5% to GDP after subtracting 4.3% last quarter. The good news is personal consumption expenditures is a leading indicator while the change in private inventories is a lagging indicator. Calculated Risk has a great set of charts on this theme in GDP Report: The Good News. The following GDP Table helps show how some of the numbers mentioned above relate to each other. Bloomberg is reporting Volcker Says the U.S. Economy Is ‘Leveling Off’. The U.S. economy is “leveling off at a low level” and doesn’t need a second fiscal stimulus package, said former Federal Reserve Chairman Paul Volcker, one of President Barack Obama’s top economic advisers. Volcker, head of Obama’s Economic Recovery Advisory Board, said the 6.1 percent decline in first-quarter gross domestic product reported by the government today was “expected.” More recent data show the contraction in housing, business spending and inventories has slowed, and stimulus spending is only just beginning to hit the economy, he said. Volcker agreed with economists who say the expansion of the Fed’s balance sheet, to more than $2.2 trillion as of last week, might pose an inflation danger at some point. Volcker said he wouldn’t favor bringing back the Glass-Steagall Act, repealed in 1999 with the support of then-Treasury Secretary Summers. He would, however, separate commercial-bank functions from what he calls “traders,” venture capital funds, private equity funds and hedge funds. Anyone claiming "Fed Chairman Ben S. Bernanke is doing a great job" is going to lose credibility with a lot of people. Still others (but not me) will be moaning about Volcker's position on Glass-Steagall, a position that is quite similar to mine. For further discussion of Glass-Steagall and regulation in general, please see Anti-Libertarian Nonsense From Henry Kaufman & Company. Volcker is suggesting door number 3. I vote for what's behind door number 1 or door number 4 on the grounds there is too much debt overhang, too few jobs, and no sustainable driver for jobs looking ahead. In addition, there is little support for more stimulus in Congress and whatever lift the economy gets out of inventory replenishment and the Congressional stimulus will eventually fade. If the recession ends later this year, plan on a revisit in 2010-2011 and anemic growth at best for a long time thereafter. The Case for an "L" Shaped Recession (or series of recessions) is still very much alive.